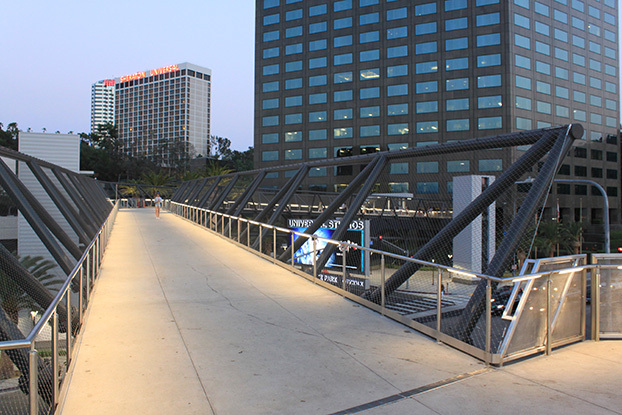 The Universal City Pedestrian Bridge is an important transportation link that eases traffic on Lankershim Boulevard and Universal Hollywood Drive, while providing safe uninterrupted passage for pedestrians between the Metro Universal City Red Line Station and the Universal Studios tram stop. 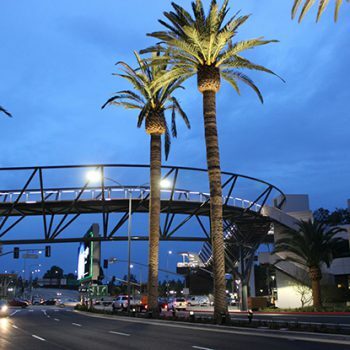 The project consisted of the construction of an open truss architectural bridge 410 feet in length that is accessible from three corners of the busy intersection. 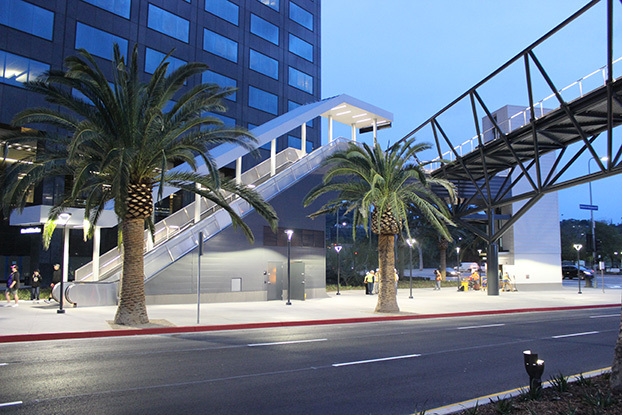 Patrons may ascend to the bridge by either of two escalators, three elevators or the three stairways. 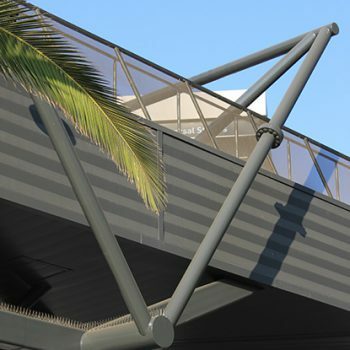 Protected by a stainless steel webnet and stainless steel guardrails and well-lit by internally illuminated handrail, patrons have access across the bridge at all hours. 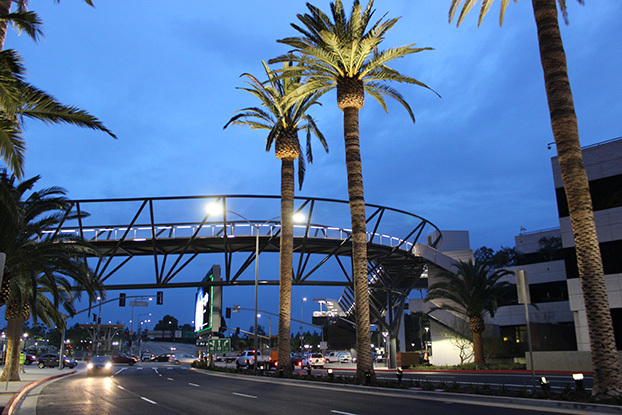 The project is Griffith’s first major design build contract. 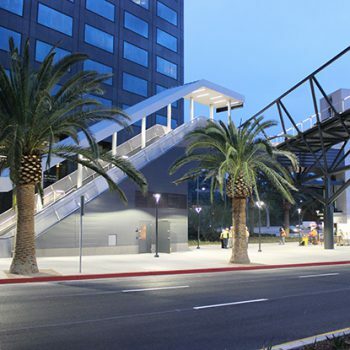 Working with Miyamoto International, Inc. as its lead design engineer, Thompson Metal Fab from Vancouver, WA and steel erector Danny’s Construction we began coordination for the fabrication, delivery, and erection of the structural steel bridge almost immediately after contract award. Due to the high traffic volume and high visibility of the intersection, the contract restricted lane closures significantly. 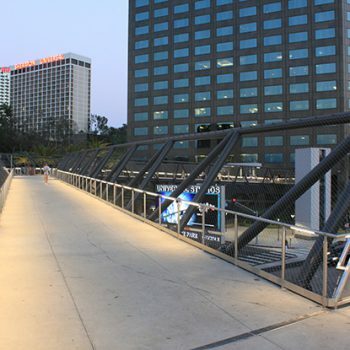 Griffith and its team planned around the obstacles by fabricating and fitting together the bridge in Vancouver. Without space available on-site for storage, the bridge made its week-long journey to the project site under state highway patrol escorts. 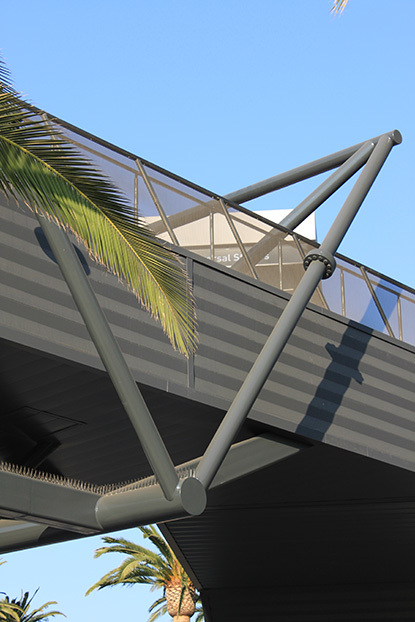 Under this Just-in-Time delivery method, the steel was erected immediately upon arrival. To meet the grand opening of a major attraction at the adjacent theme park, we successfully accelerated the project by four months. 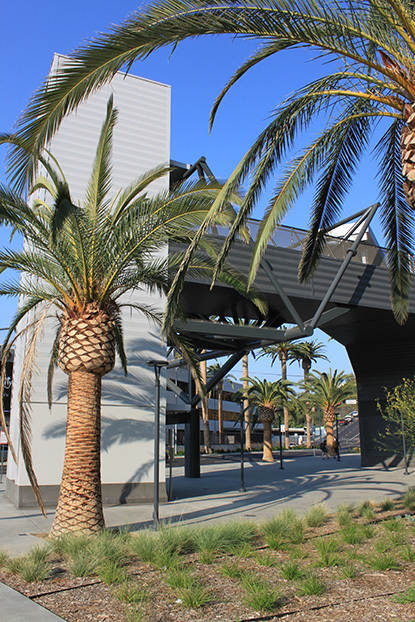 Our project team worked diligently to keep all stakeholders informed and involved during the design and construction of the high-profile project. 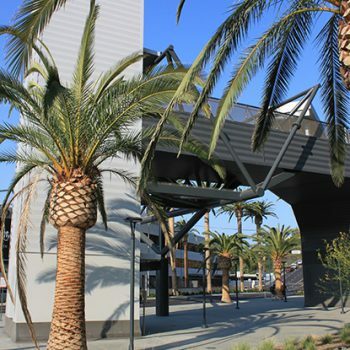 Key stakeholders included Universal Studios, Sheraton and Hilton Hotels, the NBC Universal backlot and production facilities, the high-rise tenants, an adjacent historical monument and organization, and numerous neighborhood councils and associations.